Synopsis: Who's Who of the Elite V9 is designed to inform the general public about the Elite and to provide the names of almost 15,000 of their members since the secret organizations were established until the year 2009. Many Americans hear the news about the state of the world today and wonder, "What's going wrong? What's happening here? I don't feel that I'm in control of anything anymore." There are some that are aware of what's happening, but millions more would be shocked to learn the truth. The answers are slowly emerging. This book tells you everything that you need to know about what's going wrong, and what is happening here, and all over the world. In it, you will find complete lists of names of the very people who are in control of what's going on. These are the wheelers and dealers of the biggest stock of all; peoples' lives. With this book, you can better arm yourself with the knowledge that has awakened thousands of other people wondering about the same things that you are. 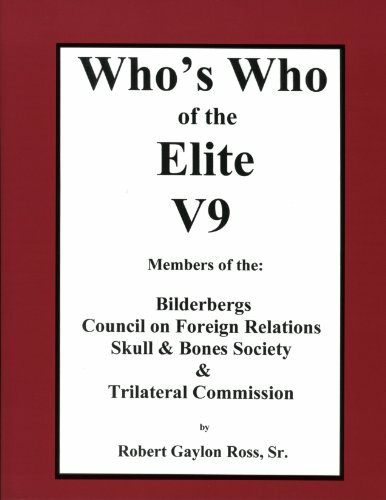 Who's Who of the Elite V9 is the book "they" don't want you to see. This is the information "they" don't want you to know. Many books will tell you the truth, but no other book condenses it all together in one source like this one does. It gives a brief history of the Bilderbergs (BB), Council on Foreign Relations (CFR), Trilateral Commission (TC), and Skull & Bones Society (S & B). It lists the members by name (alphabetically), secret organizations that they belong to, their "day job" title and their affiliation. The Council on Foreign Relations was formed in 1921 and from then to 2009 there were 9,506 members.The Skull & Bones Society was formed in 1832 and from then to 2009 there were 2,287 members.The Bilderbergs were formed in 1954 and from then to 2009 there were 1,816 members.The Trilateral Commission was formed in 1971 and from then to 2009 there were 1,023 members. About the Author&colon; Robert Gaylon Ross, Sr. is author of the bestselling reference works, Who's Who of The Elite, The Elite Don't Dare Let Us Tell the People, the groundbreaking volume, The Elite Serial Killers of Lincoln, JFK, RFK, and MLK and the latest book, What the Elite Have Done to America and How To Fix It. A graduate of Texas A & M University and a former Registered & Certified Professional Engineer, Ross served as an Intelligence Officer in the U.S. Army Security Agency (big brother to the CIA & part of the NSA) in South Korea. After his military service he had a distinguished career in the petroleum industry, in factory management, and as an International Management Consultant working in Japan, Mexico, Canada, England, Iran, and in the United States. He now spends all of his available time writing about the Elite, who would love to create a Global Union, if we let them.A frequent speaker on the subject of the Elite all over the US, Canada, and Australia.Listed in Who's Who in the Media and Communications, by Marquis.